Have no fear; things have been delicious and good in my life. Unfortunately, it has all been very chaotic and this has forced me to step away from the stove. Long days and tired nights have led me to fall in love with leftovers. I used to look down on them, but over the last few weeks they’ve grown to become my friends. Our relationship with food is ever changing. Right now I simply don’t have the time for flair-tastic meals, but that doesn’t mean I’ve succumbed to take out and junk food. I’ve found new, fast, and fulfilling ways to keep my cooking hand strong while maintaining some semblance of sanity. I look forward to the less hectic days once this semester is over when I can find time to get back to my lackadaisical and ingredient heavy kitchen roots, but I’ve found enjoyment in this culinary break. I “adapted” the amounts of cream and sugar for the recipe, due to the fact that I was borrowing the neighbor’s cream and I wanted to see if I could get that sweet taste while still drawing back on the amount of sugar. My “adaption” was most delicious and won’t leave you feeling like you’ve been cheated. Plus, it allows the flavor of the whole foods to shine through. 1. 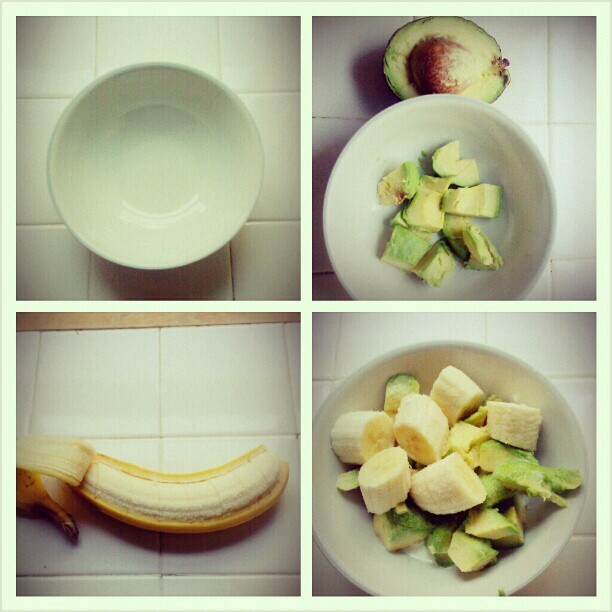 Add diced avocado and banana to a bowl. 2. Measure lime juice, sugar and cream into the bowl. 3. Mix ingredients together gently. Few things in life are better than cutting into an avocado to find perfectly ripened, rich and (healthy) fatty perfection.